The Australian Government's business portal has been led through massive customer centric change the past 10 years by Simon Fisher. How business.gov.au measures the value - in time and money saved for businesses. And what they were able to do with the time and money saved by them! Or download and subscribe to future episodes using iTunes or Stitcher for Android. G'day folks, my name's Gavin Atkinson, welcome to another edition of the Government to Business podcast. Now, this is one I've been wanting to deliver for a little while now, it's one of the interviews that I like to be able to do with leading professionals in the Government to Business space around the world and for quite a long while I've actually been doing interviews with people who based in Europe and America and this is the first time I've actually got an Australian on the show, and that is Simon Fisher, who is the Content Manager for Business.gov.au, the Australian Government's business portal. Now Simon has been in this game for quite a long while and Simon and I have share a long history together. In this particular interview we talk around what's the Australian Government approach is towards a customer-centric digital service delivery to business, particularly in a federated environment. Now that federated environment isn't just within the national government, we've got different departments and so forth. But also, how does that national level then deal with state-based levels and even theoretically going down into the local based levels as well. We talk about how Simon has been at Business.gov.au in using social media, search engine optimization and other strategies to get the message out about the resources on the website at relatively minimal cost. And also to start looking at the practical steps that they have taken to convert complex content and concepts into plain English. Now this is a really interesting thing when Simon starts talking around this element, around how do you get the lawyers on board and signing off on plain English where you've removed all the bureaucratic legalese out of things, but yet it's still actually able to stand up so to speak in a court of law. So that's a really interesting part of the interview, we also go on and talk around the differences between usability testing in a controlled environment and actually going to the place where business owners are actually using their computers when they're conducting their business. And of course, we also touch on how Business.gov.au measures the time and money saving that they've been able to deliver to businesses and I suppose more from that qualitative point of view, what those business owners have been able to do with that time and money that they've been able to save. So a really great interview, this is a little bit long just under an hour, but I think you'll find there's lots and lots of great things to learn from this particular interview. I must admit I recorded this one with Simon face-to-face. So the first face-to-face interview I've done on the show and this was actually done in a very small office where it was a little bit echoey. So I do apologize for the audio quality. It's probably not quite as good as normal, but that being said I think you'll still find the information in it is really, really useful. So sit back, relax and enjoy the great learnings and lessons from Simon Fisher, the Content Manager of Business.gov.au. Gavin: We've known each other for a little while now. Quite a few years. Do you want to talk a little bit around what you do for Business.gov.au, and how that particular website is taking things forward at the moment when it comes to business customers? service and also working on some other projects internally but for most of the time it's been pretty constant. And I think what we're trying to do with Business.gov.au, it's a whole of government service, it was one of the first whole of government services developed certainly in Australia and across the world as well. And what we're trying to do is just make it easier for businesses to navigate the bureaucratic structure of government. They don't understand how government works and we figure neither should they have to understand it. So a lot of what we do is dealing very closely with our colleagues in other agencies, which is always a challenge. But we do a lot of work with the likes of the Australian Tax Office, the Fair Work Ombudsman who all have touch points with business and what we're trying to do is trying to get a, everyone on the same page, a single voice for the Australian Government if you like, talking to business and I guess at the heart of that one, we've always tried to push is having our users, having the businesses at the centre of everything we're doing. So purely by a nature as a whole of government service, we don't present a particular view of any particular agency. We don't structure ourselves according to the bureaucracies. So what we try to do is think of it differently: a businesses perspective. And try to empathize with how they deal with government. How do they see government? How do they want to deal with government? And we've always put a big emphasis on user research, on speaking with our customers, getting out amongst them and basically, trying to get away from behind our desks in Canberra, get around the country and get around talking to businesses. Gavin: So what's been the feedback from those businesses around what you're doing? Simon: Generally feedback's very positive. Certainly the services we deliver have always had a high customer satisfaction rate. Very happy. There's always a frustration - not a frustration - businesses as I said don't understand the structure of government. They find government hard to tell apart. So from their perspective, while it might be positive about Business.gov.au, there might be other areas the government they're not so positive about, but from their perspective it's all government. So what we do try to do is look across outside of just what we do and identify areas that might not be working as well as they might within other agencies and sort of work with them as well. So we try hard not to just sit back on our laurels and go everyone loves Business.gov.au, well done. we prefer if the businesses are telling us that something else in government isn't working we try to go out and help make the experience better. Gavin: So how do you do that? Simon: We have, over the years we've built very good relationships with all the other agencies. We've done, we invest a lot of time in stakeholder engagement in sort of going out and talking to other agencies we if we doing projects we invite other agencies to come and work with us. We've worked with the Australian Tax Office, for example on the Fix-It Squads, which is a great initiative that brings together different agencies, across state and federal government to work together to try and tackle a common problem. And we found out of those relationships and out of those joint projects, we've built up a bit of credibility if you like with the other agencies, so it's, you really have to, what's that term? You really have to "have skin in the game." You know, we can't just go to a particular agency with "We're getting feedback that this service is no good. Can you fix it?" We actually go out and say we've got feedback, this service might be working as well as it can, we'd like to work with you to improve it. And we found increasingly other agencies are coming to us, to ask for our assistance. Gavin: Beyond those type of main ones like Fair Work, and the ATO and others? Simon: Yeah, we done a lot of work with IP Australia because obviously around patents, trademarks. We've done a lot of work with them. We've worked with state governments through some of our whole of government services like the SmartForms service, we've worked with local governments as well. And it's often the smaller agencies that probably are more keen to work with us just because the likes of the Tax Office, Fair Work, they've got resources behind them. They've got expertise. They've already got a big reach, you know a sort of captive customer base. Whereas the smaller agencies we find we can help them get their message out to a lot more businesses. Also we can come with expertise around developing content, developing digital services that they might not have. So it's a win for them. You know, they don't have to invest the resources or go outside the public service necessarily to find those skills. Gavin: So from being involved in this for ten years, you've obviously seen a lot of growth happen in that space both with customers and also building those relationships. How did you kind of start those relationships early on, because you mentioned a number of the services that you've kind of partnered and brought across from other agencies and delivered those, and delivered those well. But how did you first kind of build up that initial rapport and reputation to convince them to come on that journey? Simon: I think initially we built up a reputation about delivering services. That was obviously first we had to get our own house in order. We had personally, our team had to deliver quality services, so we did have some credibility we had feedback, we had that feedback from businesses that we could take to other agencies. I think probably a lot of it kicked off when we did, there was a government initiative around starting a business, where the government really wanted to bring together all the starting services together. They had a lot of feedback from government, from businesses that it was just too difficult to work out what was what. So the Small Business Minister at the time tasked us with doing that work because she knew the reputation we had. And from there it was very much a working with them, not doing something to them. So it wasn't just we're going, we know everything about everything, we're going to just produce this resource and put it out there. We actually valued our colleagues expertise. We made sure we went out and sorted it out so obviously anything to do a tax, we go to the Australian Taxation Office. We actually bring them along. We say we made your help with this. We want to partner with you and work with you. Give them some credit. We would steer, make sure they felt part of the overall package and then when we delivered the final service, you know, we made sure that it was very much, so it wasn't done as a: "this is done by the Department of Industry, aren't we good?" We made sure that all colleagues and all the other departments were recognized for their contribution. Gavin: I'm kind of guessing that along the way it hasn't always been rosie and there's been challenges. Broadly speaking. How have you tried to address those challenges? Ministers. Everyone's got their own executive to work to, particularly when there's change, you know, new ministers or a new executive comes in, they've quite naturally want to put their own stamp, have something to deliver. We find that's always challenged at that point. How can we avoid, you know, until they're reinventing the wheel while giving, while making sure that the executive or you know, the minister in question gets their moment of the sunshine. So we found with those sort of cases, there is a bit of give and take. You know, we're ultimately we're one government, ultimately the customers don't see individual agencies, they don't see individual departments. So from our perspective we sort of pack in the ego away, and just sort of going in making sure we've in the best after the customer and if that means a particular service or something is delivered through a different agency or is branded as a different agency, you just wear that and recognize that that's just the price sometimes that has to be paid to deliver an excellent service. And that involves some internal politics as well. You know, we do have to go to our executive and sort of explain why we spend, we're invested time working with this other agency or this other agency's projects, but you know usually our executive will take a broader view and we'll be happy to, happy to support. Gavin: Do you have any of those agencies involved more broadly when it comes to any of the governance around how you manage things or you kind of just manage those relationships at a more, you know, one-on-one more bilateral manner? few years. So since I think since the DTA, or the Digital Transformation Agency was established, we have done more, they've been more proactive in bringing together agencies to work together. So now when we're leading the project we'll intentionally go out and seek expertise from other agencies to be part of the team because they always bring different perspectives, different points of view and we also, When we did our last redevelopment on the website, we actually had someone from the Australian Taxation Office on our board. So we had a board overseeing all that work and we had people from the Tax Office and Treasury. And policy partners from Treasury as well on the board so they could bring that extra perspective. Gavin: So what type of benefits do you get from having that larger ownership over what you're doing? Simon: Certainly from the, when small business responsibilities, responsibility for small business policy moved to the Treasury, so it moved to a, in Australia a central, one of the central agencies. We certainly found that would sort of, it just sort of opened doors to a broader, to more senior ministers or also brought that macro, much more macroeconomic viewpoint so we could, so our colleagues in the Treasury really had a good grasp on where the government wanted to take the economy forward more broadly, where they saw opportunities so they could take, they could bring that perspective and at the Department of Industry we really pride ourselves on service delivery. We deliver very high quality services but you know, that brought that extra, that extra perspective on the Treasury side, and for example, having the ATO in the room, obviously they're dealing with the same people we are. They're always dealing with businesses and they could really bring a wealth of knowledge and research into the camp as well. So we were getting the benefits both of the work that had already been done and that sort of broader picture from government. Gavin: Okay, you talked a little bit around the, I suppose the government's focus from a macro-economic viewpoint, trying to grow that business environment across Australia. That's obviously a key performance measure or indicator of one form or another. What other type of key measures do you currently, are your goals you're trying to aim for? Simon: At the moment, I mean the key goals of Business.gov.au have always been saving businesses time and money, navigating their way through government. So when it was first set up, It's a recurring theme with research government does, that businesses have difficulty navigating government. They don't know who to talk to. They don't know what level of government does what. And it can be very tricky to find who to talk to. Particularly I mean, the really big sort of things like tax, employment, it's quite easy to find. But you know, there's all sorts of niches that Government get into that can be really difficult to discover who you should be actually talking to. And I think especially with Australia's three levels of government it becomes even harder. People just expect that they can approach government no matter which level and they can get an answer. So what we really look for is how much time do we save businesses? there's a lot of information from government that is, that the commercial sector or the private sector does repackage and onforward at a cost, and businesses aren't always aware that this information is about available for free from government. So we do a lot of them put a little a lot of effort into making sure that businesses are aware that information from government they shouldn't have to pay for information from government and I mean these service providers are, they do provide government information as part of a value add which is a legitimate business model, but some of them are just selling government information that's freely available. So we want to avoid if possible, Well, we want to make sure businesses are making an informed choice. If I want to go to one of these service providers, that's their choice. But we want to make sure they know that this information is available at no cost. So I guess key drivers: saving businesses time and saving them money by ensuring that they're not unnecessarily paying money they don't have to. Gavin: A couple things. Business.gov.au has a really strong social media presence, so I'm kind of assuming that's one way you try to get that message out around "Hey we've got all these great resources and they're free," and so forth. What other steps have you taken around trying to get that message out and push that within the marketplace? Simon: That's always been a struggle simply because government as a rule doesn't have a lot of money for marketing, so we don't spend a lot of money on paid advertising. It'd be nice if we had the budgets of some of the bigger private sectors, but we just don't. So what we've done in addition to the social media channels, we put a big emphasis on search engine optimization and we actually write quality content. and what that meant was other government websites and non-government websites could pick up our content and repackage it basically and present as part of their own service offering. Now sometimes the customers wouldn't even know that that content came from Business.gov.au and frankly, we didn't care. So long as the businesses were getting the information that was all we worried about. So we made sure that if people wanted to discover the content through the website, they can find it by search engines. We push content out through our partners, we use social media to go out. We have, the department has an on-the-ground network of business advisors and we also pay people to, or we engage service providers to deliver business advice. We make sure that they're all very active advocates for the site, so if they're out talking to businesses, and they talk to thousands of businesses every year, they're making sure that people are aware of the website. And we also partner with other, you know, fellow government agencies to make sure that, you know, to leverage their communication channels. So if the Department of Employment is doing a big push out to employers, we'll often get them to include us in their communication. So the usual message is if it's coming from a government department go to the, you know, the particular department for advice about this specific information, but for everything else go to Business.gov.au. So that pattern has sort of, developed across the Australian Government. Gavin: Very good. You touched a little... let's keep going down this wormhole a little bit more. You talked about, you know, having good quality content is, you know, a key way upon getting that message out for search engine optimization. So what's been that actual content strategy and how do you ensure you've got quality content out there for businesses? Simon: So I guess, we found very early on that plain, you know, writing in plain English writing quality content is absolutely essential. I think, recent figures I think, seventy percent of Australian business owners don't have a secondary education, hadn't gone to university. A increasing percentage of Australians from non-English speaking backgrounds and so delivering content in plain English is absolutely essential. I mean that's, that now works for the majority of our, most of our users. If we weren't delivering in plain English they just couldn't understand what on Earth we were talking about. So I think it's, the original driver was looking at our audience making sure we're meeting their user needs. And, what we do we place a big emphasis on training our own team. So we've got a team of professional content writers, we made sure they're all trained in how to write in plain English. We've got a pretty ruthless internal quality assurance process where all content is peer reviewed and discussed amongst the team. We do a lot of user testing, we test our content with our users. We put it in front of them, get them to, can they comprehend it? Is it hitting the mark? Iterate. Republish. We, we've also started implementing that across within our own department, so we used to offer a plain English service so people would, particularly our program areas, if they were running their program that gives their program guidelines or their FAQ's and ask us to rewrite them as plain English. Gavin: So is that just within the department or do you kind of send that out to other partner agencies that you work with when it comes to content? Simon: We certainly, when we partner with other projects, with other agencies, we certainly push that. So the DTA at the moment is doing a whole of government content strategy where they're trying to push that approach so we've been, we've actually been the lead in a couple of modules there. Probably a good example when we did the, recently we did a project that was explaining to businesses whether they're a business or a hobby, because we found doing the user research, it was really unclear. People weren't sure whether what their activity, where's the fine line? And we found we couldn't explain it for them either within government. So we thought okay, let's try to do something about this. Gavin: Even though it makes perfect sense! Simon: Exactly. So that was alright. We found that was very successful as well. the outcome. Which is a big win for us. Gavin: So for listeners who aren't in Australia, basically the Australian Taxation Office will kind of create a set of rules, you know, there's legislation and then someone may try to push those rules or the limits of it a little bit and then the Tax Office doesn't like that and then they end up kind of coming up with an official ruling on what the legislation is. Simon: Yeah, so that one worked really well, and I think the other thing we've started doing a lot more in the last couple of years is with a lot of our user research is making that a lot more visible to our executive, to our stakeholders. So when we are going out and speaking to businesses, sort of putting a putting a face to our customers. Yeah, a lot of the time we've sort of developed content programs, we push it out through the website and we sort of look at what's, you know, we sort of try to guess how it's been received, based on feedback received. By looking at our stats, our packages or whatever. And what we've tried to do is actually when we're going out, speaking to users, sort of bringing that back to the team, bringing it back to our developers. We found it's very powerful, for the people who're actually coding services if that's required. And you know traditionally again developers have sort of sat, worked off a spec, coded something and then handed it over. We try to get them out, involved in our, working with our users as well, so they could actually see the impact of their service. Simon: It's very, I think it's very eye opening. Well, I mean it to be honest for us as well, you know, we write content, we think, "Wow this is great, great content," and then we put it in front of the user and they, you know, we may have met all the Flesch–Kincaid plain English measures and everything but completely missed the mark with the comprehension, the interpretation. You're absolutely right. So even for our own people, for our content writers, there's nothing more humbling I guess than something, than seeing someone interact with your piece of content or your digital service and seeing how they react. So it can be very confronting and even a little bit disheartening to start with, but at the same time once you've iterated and got it right, there's nothing more satisfying than seeing someone breeze through content or you know a digital service and get a great outcome. Gavin: So how often do you get to do that with the new offerings? Simon: With new offerings we've over the past few years, we do that a lot more so we now operate now in more of an agile environment. So two week sprints. And we usually try to do user testing in every sprint. When we were doing the business or hobby tool - we were doing, actually we were doing user testing every week. So I think we had testing Tuesday. So we got on a really nice cadence where we'd sort of code, build the content, have it ready on the Monday. Tuesday we test it. Wednesday we'd review what the testing found. Thursday, Friday, Monday, we'd iterate, rejig it, test again on the Tuesday and so forth. We don't always do, we don't always test weekly sometimes it's simply not practical. you know, a screen design that's on a piece of paper or we don't wait until content's sitting nicely formatted on a web page. We might just print it and take it out for people to read so we try to get users involved in what we're doing a lot earlier. Gavin: So was that originally driven from the Australian Government's Digital Transformation Agency or was that something you were kind of already working on beforehand? Simon: I think we were, we were heading in that direction, but I think the DTA really super charged that across government. So I think what the DTA, probably the biggest influence they've had was showing to departments that you didn't have to pay consultants big money to go out and do this for you. You could do it yourself. In fact you get better outcomes If you do it yourself. So what we did was within our department or certainly working within Business.gov.au, we embedded a couple of user researchers and UX professionals in the team. We worked with, we have them in the team for I think eight months or so and when we brought them on board, we've actually said we want you to teach the entire team how to do user research, the good principles of user centered design and what we do is gradually they would skill up our people. So initially when we did the usability testing, they would lead the session that one of our team would observe, and then after while they'd swap over. So our team would lead the session and the professional we brought in would observe. So gradually we have that knowledge, that skills transfer over and I think that's the big impact that I've seen the DTA has head. Really getting everyone involved in the testing and one of the other things they always push is get your executive involved as well. So we've pulled in senior executive service people into our testing sessions and it's a bit, you know, it might be a bit awkward for them. They're told you sit there, you take notes, you don't say anything. But it's been really good that that could actually see, you know, they've been able to see the impact as well. Simon: Yes, I think that's big. That's a big change. I've seen that the last few years. Gavin: From the couple of stints you've had at the DTA, obviously you were there in the context of transformation projects for business customers and presumably there are lots of people they're also looking at the transformation projects for citizen customers. In spending some time there did you kind of get an appreciation around what the different needs were and how to tailor that more when it comes to business customers as opposed to citizens? Simon: We did actually. I mean one of the, the way the DTA, they were, running a number of what they called exemplar projects in parallel and they all had us sitting in the same room so we were doing the business or hobby, next to us was I think a Department of Human Services project looking at registering a child for the first time, we have immigration looking at import and export. Had the ACT (Australian Capital Territory) Government looking at a booking in childcare services. So we, and the DTA really encouraged us to attend each other's showcases. So you know, we'd always go along see what the other agencies were doing and I think the very common theme we saw across all, was that people usually don't deal with government necessarily out of choice its when they have to. And often they deal with government at sometimes at the worst times of their life. So they might deal with Centrelink when they've suddenly been sacked. They might come to us, speak to our business advisors when, you know, there's a sudden shock to their industry has meant their business is taking some downturn. And I think what that really sort of showed was that, I guess having that, building that empathy with the users is very important in sort of recognizing that what they're going through at that time is a lot more traumatic than us, you know, necessarily sitting here to live in the service, but I don't think we always have an appreciation for how much impact our services can have. And if we don't do it right, I guess how negatively we can just add to a situation. So if people are coming to government for help or they have to, they've got a million other things going on in their lives and we really, you know, it's really an onus is on government to make sure that our bit of the, you know, of what they're going through is made as seamless and as painless as possible. So I really liked how the DTA put the emphasis on, you know, building more humane services. So bearing in mind that when someone comes to Business.gov.au, and even in the business space, if someone's going to Business.gov.au, and looking at the information about emergency management or trying to register something. We don't know what else is going on in their lives and we should build our services on the assumption that if they come looking for emergency management information, something's pretty bad is going on with their business and we should help them as much as we can, as quickly as we can because they've obviously got a whole bunch of other stuff to get on with. Gavin: Did you, to kind of get that perspective, how did you do that? Was that through customer journey mapping or some other, with interviews or, how did you get that appreciation of what the customer was experiencing? Simon: I think that really comes down to probably the ethnographic research. So again, I guess it's a step. We started off with, engaging a company to do usability testing for us, so we basically pay someone to go out and tell us what our users were saying. We stepped that up one, to actually become involved in the user testing but initially that was done like within our own government controlled environments. So we would, we'd get people to come to us, back to a specialist usability lab, you know with two-way mirrors or whatever or some sort of control, somewhere we can control the environment, and I guess what we've done, what we've been doing in the last couple of years is taking the next step and it's actually going out and doing research in where people do business, where they actually live. So we went and did some testing earlier this year on one of our services and we decided, we're going to do usability testing, but we decided we'd do half in the business environment and half in a controlled environment and when we mean to, when we went out to do the interviews in the business environment, the first person we spoke to, she was looking to set up a restaurant with her husband, this is in Perth, and we said can you access your computer so you can do this and I think one of us ended up being perched on the edge of her bed. The other one was sitting on the floor because where she did all her computer work they had a, they had one computer which was running Vista I think and was sitting in the corner of their bedroom because they were just in a tiny flat. So that was really eye-opening because you know we went and did usability testing and we could see, you know, they didn't have perfect internet and running an old system, but we could actually get an appreciation for when they do their work, you know, this couple had children we managed to get the lady, you know when the kids were at school, but she took most days, you know, they're doing this stuff at 11 o'clock at night and they're tired. They've got better things to do and that's a real, I guess that's a real eye opener, you know, they don't always have, can put aside an hour of their time or whatever, two hours to do it. So I think taking that next step and going the ethnographic research, it's been really great because the next person' we spoke to only had a phone. Simon: Yeah. Yeah, so doing that. So it was like I think that's really, that's a real eye opener. I mean from a lot of the businesses we've spoken I'd say, you know, we should do most of our user testing at like 11:00 p.m. at night because that's when they're using our services. And if you look at, if you look at even look at our statistics, you can see this big spike in the evening. Gavin: That's a great lesson. Simon: It is and it's, that has been a real step up in our understanding. Yeah, I'm very glad we're doing that sort of research now. Gavin: What's the most difficult problem you've got right now with Business.gov.au? Simon: I think our biggest problem at the moment, it's still the, I think bringing together the... it's the disparate, I think, with a lot of things we trying to do with different technology, maturity and systems between different government agencies, so what we're really trying to do at the moment is joining up government services. So research sort of showed people, businesses, they don't really care which agency they're dealing with, they just see government. But what they do want government to do is to join up services together. So that, you know, they're only doing things once or the journey is really clearly signposted. So if we send, if someone has to go through three agencies to complete a transaction, ideally, you want all those transactions together, which there's a lot of big challenges around different back-end systems, joining those up together, but failing that, people and businesses want us to say, "Okay, do your first big transaction with this agency, then we're going to hand you very neatly off to the next agency where you do the next bit and then we're going to hand you over to the next agency. However, we're all working in our own silos, we're all trying to solve the same problem and it can be very tricky to sort of persuade other agencies to see the whole of government picture. I think that's changing which is good. I think there's a lot more of a view towards centralizing services, but there's a long way to go and we still get that in the content. You know, there's still a lot of, we get bit by bit, you know, delivery of projects will be through Business.gov.au which is terrific, but there's some, there's still duplicate content around there, there's still, if you do a Google search across the Australian Government you'll probably find half a dozen different starting a business check lists, guides, whatever you want to talk to, call them. But and there is a challenge to sort of bring that all, to get a whole of government view that meets both political needs of everyone wanting to serve their customers, but also, you know, sort of see that serving the customer to make sure that they're getting a consistent message from the Australian Government. Gavin: But things have obviously moved a long way since when you started doing this ten years ago, from where you were back then. How long do you reckon it's going to take until you get to that nirvana you're talking around? And what needs to be done to get there? Simon: I think really what we, what we really need to do now is I think there are just, and I feel its well recognized across government there's too many websites, too many services out there. I know the Department of Industry, we're doing a lot of work, you know getting rid of our or consolidating content not just on the Business.gov.au but our Industry.gov.au and Science.gov.au platforms as well. But I think that needs to rolled out broadly across other agencies. Gavin: So I mean as I said before you've been able to take things a long way in that period of time. Many governments around the world are still acting, you know back where you were ten years ago with silos within solis within silos. From your perspective actually as a government professional, what do you think those governments are missing out on by continuing to do that rather than taking that holistic customer view? Simon: Well, I think you hit the nail on the head there, it's really shifting your focus to a customer view so rather than looking at we're not building these digital services and these websites for government. That's what I mean, that's what a lot of people do. We shouldn't be. We're building these for our customers for our users. So I think the first thing you have to flip your perspective that way, to think, "Okay, what does the user need?" Then there's the issue looking more broadly across government, I guess recognizing that everyone likes to think that they're the most important agency that an individual or a business deals with, but I think you have to get over that. You're, you know, just part of the picture and we need to work together. I think there's getting over a lot of this, issue around branding and identity that needs to be lifted up to more of a whole of government level, you know recognizing that people don't see different agencies, they don't recognize them. They don't really care. And I think what we've, bringing together, now the lead digital agencies is essential and I think certainly the Australian Government, that's what we've started to do. You know, bring it all together and ultimately, I think is following the evidence. So what are your users saying? Let that guide where you're going. And I think you'll find if you do that a lot of the other things will form, will fall into place. Gavin: You mentioned earlier, probably about halfway through the interview a bit of a discussion around key metrics and you talked around about the value that you've been delivering through to businesses in time and money saving, how that's one of your key metrics. Do you want to talk a little bit around how you determine that? Simon: Sure. What we did, starting right from the start of Business.gov.au was always intended that the initiative itself would be evaluated every four years to ensure it was delivering value to the taxpayers. So what we had to do was look at how do we measure that, how do we quantify that value so we can ensure that basically the government isn't spending more than its (inaudible), so what we, what we decided to do is we went out and basically started getting the data from our users that we've never got before. We'd already measured how many people came to the website, you know, we'd say, how long did they stay? We'd look where they went, but we weren't actually quantifying, you know, what is that? What value are they deriving? So we engaged a company to go out and sample a wide range of users. They went out, spoke to them, then we did the usual came out with a survey, piloted, tweaked it and they went out and it's basically talking to our users about what have they done differently as a result of coming to the site. You know, have they changed their business practices? Have they generated more leads? More sales? Was it simply a case that they found what they were looking for a lot quicker than they would have otherwise. When we were talking before, did they use a resource or get information that they would otherwise have paid for. So it's really getting the, talking to our users directly to find out how they benefited from the site. And also we sort of stretched that on, we sort of said, well what particularly around the time-saving if they did say save time and money, what did you do with that extra time or that extra money? And that was probably my satisfying aspect of that entire process. Gavin: They got to go to bed at nine o'clock instead of eleven. Simon: Exactly! Gavin: Or got to go to their kid's football game or something. Simon: Yeah, and that was the stories we started hearing which is really heartening to know and I guess it was, it was a wake-up call that people are giving up things in their life that they shouldn't have to, because they have to deal with government. And that's just wrong. It's really wrong. So it was very heartening, very enlightening and made it worthwhile. And I think, what we've also done with those sorts of things, at a macro whole-of-site level, we've done that. We've also recently started with particular content projects, baselining performance of content. So we recently did a major overhaul of the content about one of our flagship programs. And what we did was we took the existing content we ran it through a number of benchmarks. There's comprehension, how long did it take people to get through the content? How easy was it to get through? And then after we changed it we rebaselined it, we tested it again and we found across the board, improvements in comprehension and people had a better understanding of whether they were eligible for this program or not, which is important because it saves them time and it saves us time. Simon: Yeah, because we're not getting those erroneous sort of applications. And t didn't necessarily mean in one case they spent less time on the particular piece of information, in one piece they actually spent a bit more time, but we found that was because people would, it was so poor beforehand they wouldn't even engage with it. They'd get a couple of lines in and then just go, "forget it." Whereas the new version they actually read it all the way through and had a much understand and at the end of it. So I guess it's getting a bit more sophisticated in how we value and how we test the quality and the, you know, what user value are we actually delivering and recognizing that you can't just, you have to pick sort of metrics and goals that are relevant to your content or your service rather than just across the board. It's got to be less time. It's gotta be less this. Yeah. Yeah. Gavin: Probably wrapping things up. I mean, what do you consider to be the key or the keys of a successful Government to Business portal? Simon: I think the key is having a strong, a really strong content team who can empathize with the users and I mean, I'm not sure it's necessary, maybe this is the byproduct, but half of my content team run businesses on the side. Or you know their partners are running their business. My wife's run numerous small businesses. And so I think the most important thing is you really have to empathize with the users and that's getting out, talking to them, understanding their pain points. I think the second one's having really strong relationships with your government colleagues. I mean a whole of government service, you can't do that alone. Gavin: You can't do a lot on your own! Simon: No, I mean you can try but I think building up those relationships and really emphasizing the, I think being generous with what you're offering, making sure that you know, you're sharing credit both internally and externally so to make sure that it's a win-win across the board. So I think the people having relationships. And I think finally it's just, I think just having that executive support is really, I mean that's the sort of, makes everything so much easier. So if you, so putting together a compelling case to your executive, to the government that this, that what you're doing is worthwhile. This is valuable that it's delivering Value to your community. I think is probably the other key essential. I think if you get those three together you should be well on the way. Gavin: And in all the other work you've been doing with customers and it's happy days. Simon: Exactly. Yeah. definitely get out, talk to you customers understand and let them guide where you're going. Gavin: Fantastic. Simon Fisher, thanks so much for your time. Simon: Thanks Gav, its been a pleasure. Podcast episode 2: What must you always focus on first? 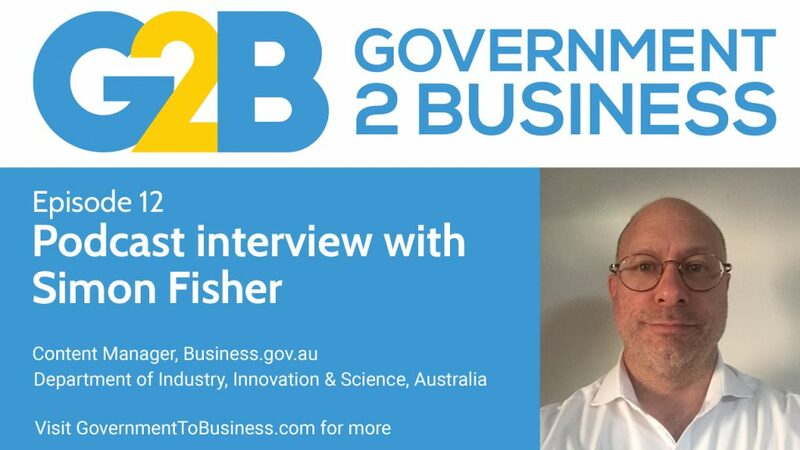 0 Comments on "Podcast episode 12: Interview with Simon Fisher of Business.gov.au"